Janet Hill sits in her living room at her home in Stratford, Ontario, October 19, 2016. Janet Hill's 150-year-old home in Stratford is part of the city's history. The Ontario cottage was built in the 1860s for workers of the nearby hotel during a time when the then town was experiencing an influx of visitors via a recently completed railway. Hill, a painter and author of the children's book Miss Moon: Wise Words from a Dog Governess, and her husband John Woodward, a manager of Fanfare Books bookstore in Stratford, moved into the dwelling in 2005 and, after initial renovation work, added an extension just last year. That addition now serves as their living room, the couple's favourite place to read, listen to records and spend time with Finnegan, their King Charles Spaniel. To stay true to the home's Victorian style, Hill and Woodward worked with Rory McDonnell and Catherine Cassidy of Build, a design firm that specializes in heritage restorations. "There are a lot of details taken from the original part of the house such as the mouldings, baseboards and wood floors," Hill says. Family members also pitched in. "My father made the built-in shelving and fireplace mantle," she adds. The couple chose North African-inspired tiles from Tabarka Studio, adding rich colour to the striking mantle. Monocled Miss 30x30-inch photograph by Slim Aarons, $1,450 (U.S.) at Jonathan Alder (www.jonathanadler.com). "The space was inspired by a Moody Sisters cottage in California. We wanted to reference that cottage but obviously take into consideration that our house is an Ontario cottage," says Hill. The Moody Sisters accumulated a cult following for the three dozen whimsical homes they built in the 1930s and 1940s near Santa Barbara. Hill's home has a similar storybook quality, with its towering slanted ceiling and raised windows. "I love the ceiling. This was a big part of the design," Hill says. "You don't see a lot of wood-clad ceilings in Ontario that are winterized, and it adds a casual, rustic elegance to the room." That rustic quality carries over to some of the furniture, such as the hand-carved credenza from Cornerstone, which sits beautifully on the lush Quebec walnut hardwood floors. 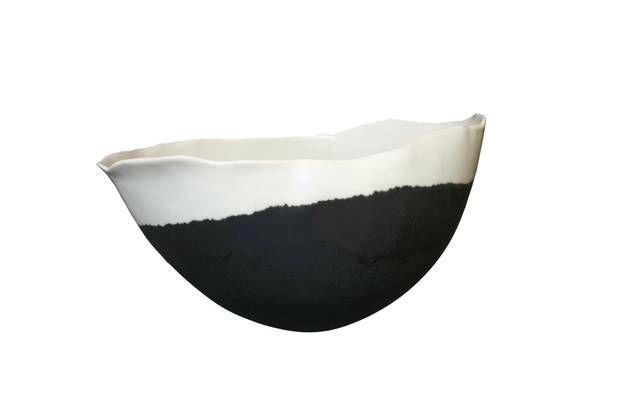 Gravity bowl by Jennifer Graham, $145 through www.jennifersgraham.com. 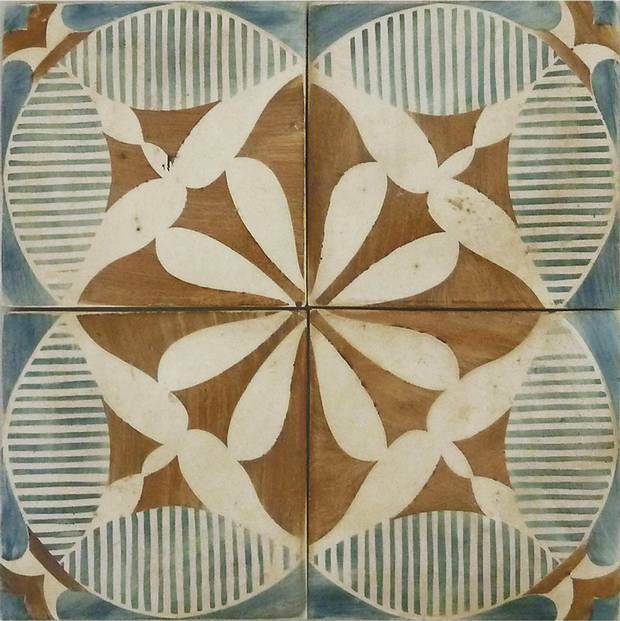 Touareg tile, price on request at Tabarka Studio (www.tabarkastudio.com). The tufted teal sofa from Southern Furniture Company and the round tan ottoman from Hudson's of Stratford fit in beautifully with the home's Victorian architecture, and the delicate site table looks as though it came from one of Hill's enchanting paintings. "It was my grandparents'," she says. "I refinished it and painted it white." Like most artists, Hill doesn't display her personal work in her home. Instead, she opted for a black-and-white bowl by local ceramics artist Jennifer Graham, and a Slim Aarons 1964 photograph, Monocled Miss. 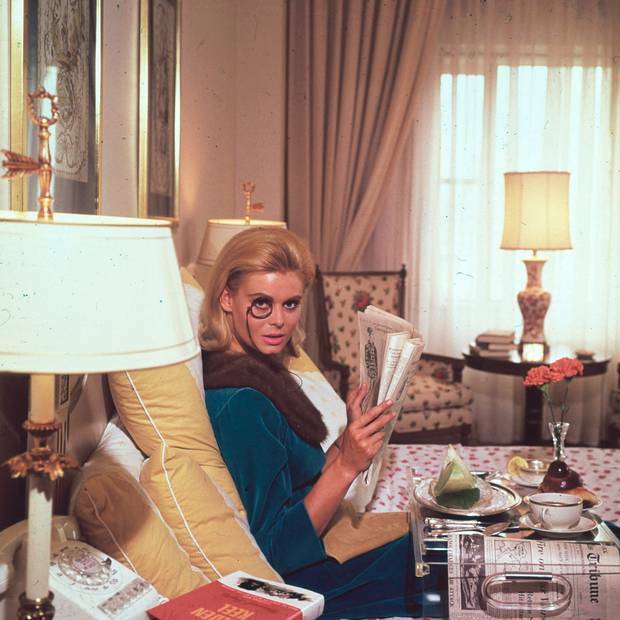 The late famed photographer who masterfully captured the world of glamorous jetsetters in the 1950s and 1960s is an ongoing source of inspiration for Hill's work. But the dreamy interiors that often appear in her paintings don't mirror the ones in her home. "The interiors that I paint are often very nostalgic and feminine with a lot of references to the 1920s through to the early 1960s. My own style is a little more eclectic and less feminine," she says. Cirrus velvet sofa, $1,099 at Article (www.article.com). 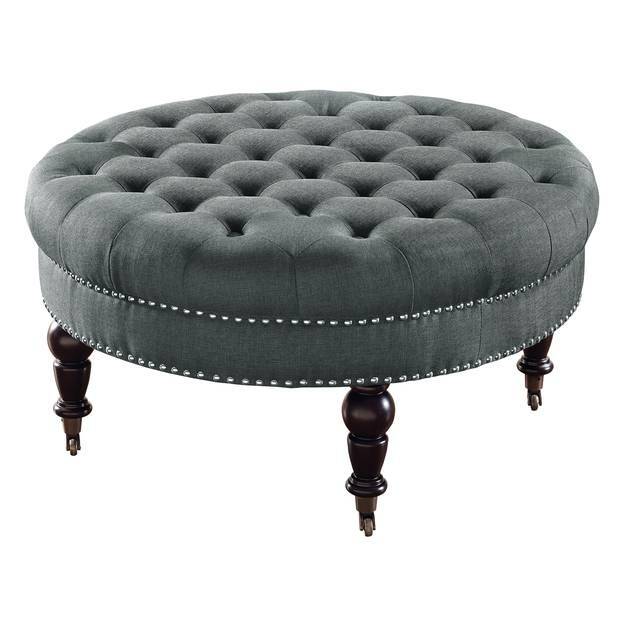 Isabelle linen tufted ottoman, $197.85 at The Home Depot (www.homedepot.com).